announcing it had been called off by the WICB and announcing a replacement tour, while the West Indies board in a later statement yesterday evening confirmed the decision. 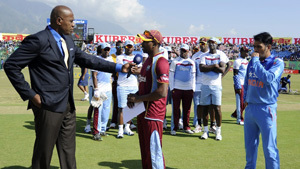 The developments followed a protracted payment structure dispute between the players, the WICB and West Indies Players’ Association. The WICB said it would make a further statement following the conclusion of the fourth ODI in Dharamsala, which India won by 59 runs. At the end of the game, the official broadcaster Star Sports displayed India as the winners of the ODI series by a 2-1 margin, though no trophy was given to MS Dhoni at the presentation ceremony. The WICB has called for a meeting at 3pm Caribbean time to discuss the developments, after which the board will explain its position. Following news of West Indies’ pullout emerged mid-way through the first innings, the BCCI said it was “shocked and disappointed” that the decision to abandon the tour had been “taken by the WICB”, and that India would now play five ODIs against Sri Lanka between November 1 and 15, after Sri Lanka Cricket accepted the invitation to fill the void. “They have withdrawn their team and this [development] has come abruptly. We received an email from Richie Richardson, the West Indies team manager, only this [Friday] morning,” BCCI secretary Sanjay Patel told ESPNcricnfo. Patel also said the board was contemplating legal action against the WICB. Late in the day, the BCCI issued a second release quoting Richardson’s email and chronicling the events of the last week to support their position: “Despite agreeing to play the fourth ODI in Dharamsala, regrettably, the current West Indies players have decided that they will not participate any further in this tour and wish to return home after this match. In light of this, I suggest that the entire squad travel to Delhi tomorrow and be booked into a hotel there, until international return flights have been booked. On behalf of the entire squad and WICB, I apologise for the inconvenience caused.” West Indies were scheduled to play a fifth ODI, one Twenty20 international and three Tests after the Dharamsala one-dayer. The BCCI’s joint secretary Anurag Thakur told PTI the West Indies players were “hell bent not to play” the fourth ODI, and only agreed to take the field upon his insistence. Before the game, Dwayne Bravo, the West Indies ODI captain, had indicated something serious was brewing when he told television commentator Ian Bishop at the toss: “Time to make a decision.” Bravo was accompanied by his West Indies team-mates, who stood beside him. The reason for the dispute was the memorandum of understanding and the combined bargaining agreement signed between WIPA and WICB in September. Bravo, acting as the player representative, had claimed that WIPA president and chief executive Wavell Hinds had kept the players in the dark over the MoU, which he allegedly signed without their consent. On the eve of the first ODI in Kochi, Bravo had warned that if Hinds did not cooperate and respond to the questions raised by the players, a strike or a pullout from the tour could not be ruled out. Though Hinds responded eventually, Bravo continued to insist that he should step down as chief executive and president, and even asked the WICB to not communicate with WIPA till a solution was found. However, WICB president Dave Cameron sent an email to Bravo saying the board would only engage with WIPA, adhering to the MoU signed in September. That development led to the West Indian players taking the extreme step of pulling out of the tour. Former West Indies seamer Michael Holding called the development “ridiculous” and “embarrassing”. “I have never seen anything like this in the past,” Holding told Sky TV. “I can see serious repercussions from this. I think this is a ridiculous decision by the West Indies Cricket Board. They like to hide behind half-truths.